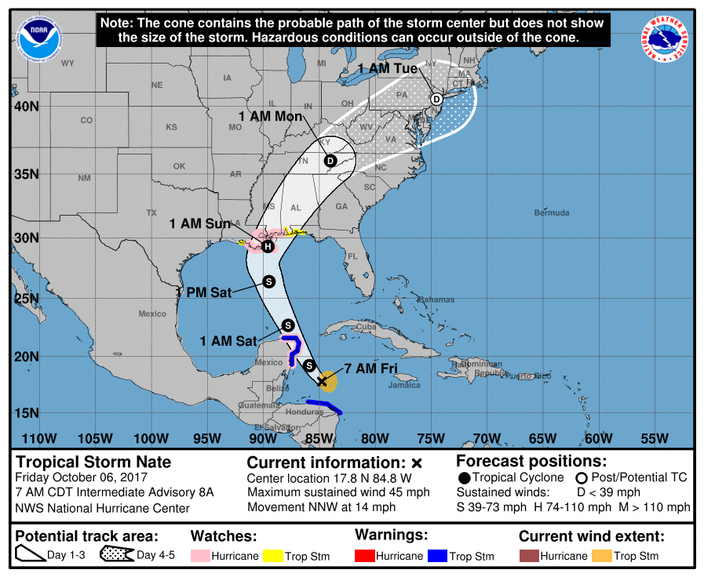 The Philadelphia area is expected to feel some effects of Tropical Storm Nate next week after it makes its U.S. landfall along the Gulf Coast over the weekend, according to an update from the National Hurricane Center. The storm, which has hit parts of Central America and claimed at least 22 lives in Nicaragua according to CNN, is expected to strengthen to a Category 1 hurricane while approaching parts of Lousiana and Alabama on Sunday. The Northeast portion of the U.S. is in Nate's probable path as it weakens to a tropical depression with wind speeds less than 39 miles per hour. The storm is expected to fall over the region between Monday and Tuesday, according to a prediction from the National Weather Service posted early Friday. Rains from the storm should ease drought conditions, Accuweather forecasters say. Much of Northeast Philly is experiencing "abnormally dry" conditions, according to a national drought monitor. The conditions are also expected to "drench" cities likes Cincinnati and Pittsburgh, but may just "soak" Philly, New York and Washington, D.C.
"As rainfall from Nate spreads northeastward across the eastern U.S., travel delays typical of most rainstorms will result," Accuweather is reporting. "However, motorists should use caution for extra slick conditions from fallen leaves and oil buildup." Philly will see a pleasant but unusually hot weekend with temperatures climbing up to the mid-80s. Next week won't feel any more like fall either, with highs expected in the upper 70s. Below is the five-day forecast for Philadelphia, South Jersey and the Poconos, according to the National Weather Service. Friday: Sunny with a high around 83 degrees and low expected to dip to 65 degrees. Saturday: Sunny with a high around 85 degrees before a chance of light showers starts at night. The low is 68 degrees. Sunday: Cloudy with a likely chance of showers throughout the day and night. The high should reach 81 degrees while the low is expected to be near 69. A half an inch of rain is possible. Monday: The high should reach 79 degrees while a 70 percent chance of rain is expected throughout the day and night. The low should reach 69 degrees. Tuesday: Showers likely, high around 81 degrees and low near 64 degrees. Friday: Sunny with a high near 83 degrees, low around 64 with light winds. Saturday: Sunny with the mercury climbing up to 84 degrees before a slight chance of showers at night. The low should reach 68 degrees. Sunday: Chance of showers in the morning after 8 a.m. and high around 81 degrees before dipping to 69 degrees. Rain is expected at night with a half an inch of accumulation possible. Monday: Rain throughout the day with a high near 79 degrees and low nearing 68 degrees. Tuesday: Chance of showers, high around 81 and low near 63. Friday: Slight chance of showers throughout the day with a high around 75 degrees and low around 58 degrees. Saturday: Fog in the morning between 7 a.m. and 8 a.m., then becoming cloudy with a chance of rain at night. The low is expected to be near 64 degrees. Sunday: Chance of showers throughout the day, high of 78 degrees and low near 63. Monday: Rain throughout the day. The high should reach 73 and low could dip down to 63 degrees. Tuesday: Chance of showers throughout the day, high near 76 degrees and low around 57.